Prep time: 30 minutes. Bake time: 1 ½ hours. On August 14, 2017, the world was gifted with the rare, coveted treat of a full-length part from PJ Ladd. The world watched in awe as PJ closed out NB Numeric’s Tricolor *with his patented devilishly quick feet and painstaking insistence on perfection. Then, as the skate gods smiled on us once more, The Berrics released PJ Ladd: A Beautiful Compilation last Saturday, which was a symphony of footage from his *Tricolor part, along with clips from other NB Numeric videos and some previously unreleased footage. Needless to say, both parts have been playing on repeat on screens all over the globe. In 2002, PJ Ladd turned the skateboarding world on its head with his part in the eponymously-titled PJ Ladd’s Wonderful, Horrible Life. A confluence of factors made WHL the undisputed champ of early ’00s shop videos, but PJ’s part—an earth-shattering performance that started softly with the world’s most famous botched kickflip (set to the lyrical lamentations of Pulp’s Like a Friend), before its unrelenting five-minute crescendo of utter insanity that ended mid-push—may very well have had the honor of ushering skateboarding into a new era of what was considered humanly possible. While Tricolor and A Beautiful Compilation are stylistically distinct from WHL (indeed, even PJ’s skating seems to have matured into a more controlled and precise craft), both edits share that same crescendo that PJ’s WHL part enjoyed. In Tricolor, PJ’s coup de grace is an all-out assault at Boston’s Eggs, in which he rifles off trick after seemingly impossible trick only to end in a flip-in/flip-out combination most couldn’t hope to land in True Skate. In A Beautiful Compilation, the first half of the video shares the same repetition and growing intensity (in both mind-boggling tricks and Cat Stevens’ powerful lyrics) that fuel the madness of WHL. However, unlike WHL and Tricolor, A Beautiful Compilation gives PJ the long-overdue second song treatment and ices the proverbial cake with a couple of minutes of the most serene wizardry to have graced skateboarding since the first half of Russel Houghten’s Open Horizon edit in The Cinematographer Project (seriously, PJ’s last courthouse line, synced with the music…). In honor of (1) the miracle of more PJ footage and (2) the Boston skate scene, as romanticized by WHL, I decided to put a twist on Boston baked beans. 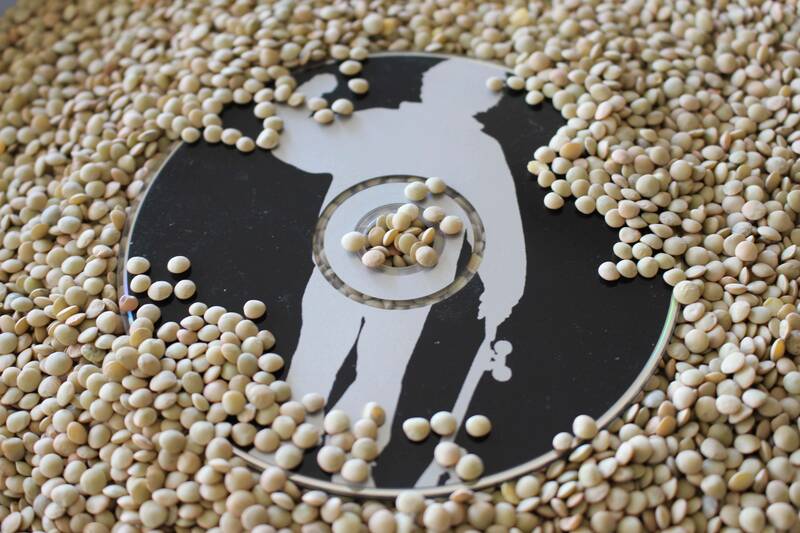 Allow me to present PJ Ladle’s Wonderful, Horrible Lentils. While Boston baked beans typically call for—you guessed it—beans, I wanted to shift gears and sub lentils for beans to give this meal an extra energy boost. 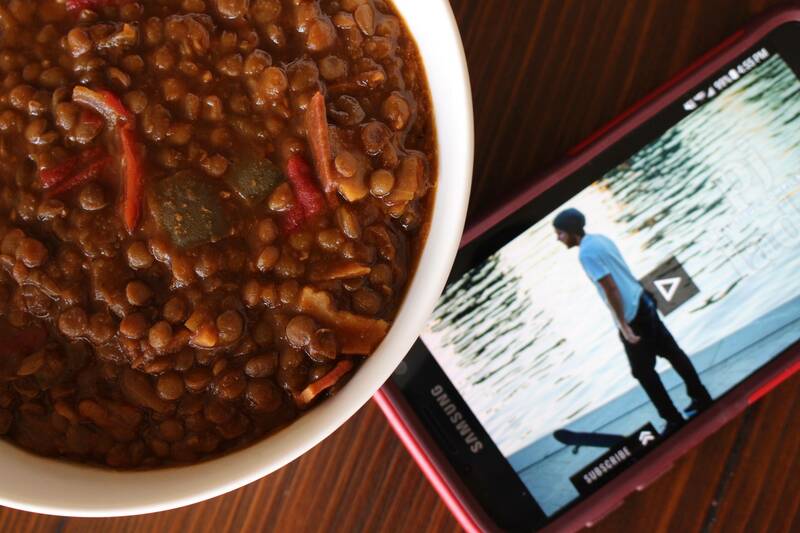 Due to their fiber and complex carbs, lentils increase steady, slow-burning energy, meaning these are the perfect food to fuel those all-day skate sessions. 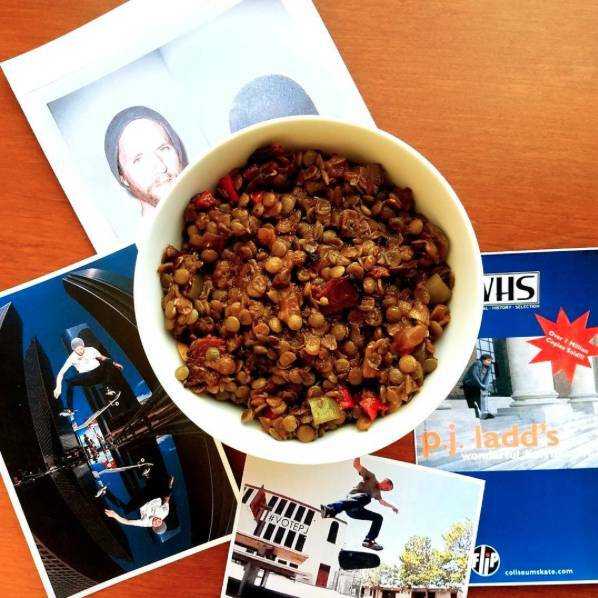 Additionally, lentils are high in protein and iron, making them also the perfect food for refueling after a skate session. While you may not be able to skate like PJ (few, if any, can), this dish should give you the energy to end your session with a push like he did in WHL. Many Boston baked beans recipes call for an alarming amount of molasses and brown sugar. While molasses is almost inseparable from the core of Boston baked anything, I’ve tried to keep it to a reasonable amount here. Additionally, I have substituted the typical ½ – ¾ cup of brown sugar for ¼ cup of agave as a lower-glycemic sweetener. Further, Boston Baked Beans typically include bacon. For obvious reasons, this recipe includes veggie bacon (I prefer Sweet Earth’s Benevolent Bacon, but any kind will do). If that’s not available, don’t fret: this recipe is so delicious that my wife and I were halfway through our first test meal when I realized that I never added the bacon. It’s a delicious complement to the meal, but you won’t be selling yourself short without it. Preheat the oven to 350° F. Rinse the lentils and then drain them in a colander. Throw them in a large pot and fill it with water so that the lentils are covered by an inch or two of water. Bring the water to a boil and then take it down to a low-heat simmer. Simmer the lentils for 25-30 minutes, stirring occasionally. Once they are tender, drain them again with a colander and put them in a large mixing bowl. Throw literally every other ingredient (except the veggie bacon) into the mixing bowl and mix it all up until everything is evenly dispersed. Spread the lentils out in an oven-safe casserole dish, throw on the lid, and bake them at 350 degrees for 90 minutes, stirring halfway through. Assuming you are adding the veggie bacon, heat up a skillet at medium heat, grease it up, and throw on enough bacon strips for 4-6 servings (depending on the brand, the amount of bacon will differ). Cook the strips for 3-4 minutes on each side, or until they reach the desired crispiness. Once those are cooked and the lentils are baked, tear the bacon up into small bits and mix into the lentils. Go watch WHL, Tricolor and A Beautiful Compilation and marvel at PJ’s abilities. Here’s the first glimpse at the upcoming Love Park documentary. Mark and Sammy handle business in Seattle. Leo Romero’s new Toy Machine commercial may brainwash you. Nyjah talks SLS, injuries, his upcoming part, and more. FRED GALL — Can You Skate It? Another skate show from Vice.